What’s up ? This is THE stephane ANDRE and today I didn’t train. I will tell you why, because I feel pain to my left shoulder and my 2 knees. 6 day ago, it was my leg day and you know, I hurt my right knee during a martial art session. So I used lightweight to train my leg. Since around 6 months, I felt pain to my shoulder (shoulder impingement) because of the dumbbell overhead shoulder press and dumbbell bench press. Since 1 months, I hurt my right knee in a martial art sparring, because I wanted to avoid a punch and my leg (my knee) was in a bad position. I had 2 injuries . I searched an alternative exercise for the dumbbell overhead shoulder press and dumbbell bench press to decrease the pain and I found out. I wrote 2 articles about it. Click here and there . As it was a leg day, I decided to do front squat with lightweight to not hurt to much my right knee. After my front squat session, I did leg press with one leg. After my warm-up set, I felt a pain in my left knee, it was like if someone hit my left knee with a knife, I stopped my rep immediately. It was the first time I felt this pain and I didn’t like it. I tried to do an another rep to see the gravity of the pain and I stopped my leg day here. I did the half of my leg day’s program and I thought it was a good idea to test the new way to do dumbbell bench press without pain. When I was walking with the dumbbell in my hands, I felt the pain in my left knee. I did this dumbbell bench press variant and I validate it. Usually after my workout, I eat my meal (my post workout is solid food). While I was eating my meal, I thought it was the time to make a break. 3 injuries is too much for me and I decided quickly to make a break of 1 month to really recover, because since 2015 I train regularly 6-7 days per weeks and the longest break I make was 10 days. Yeah, 10 days. When I realized it, I thank God of Light for his gratitude. And you know what ? When I slept, I felt I a little pain in the middle of my back. It means to do my front squat, my body compensated the weakness of my right knee with others parts of my body to be able to execute the movement. Now, it’s the 6th days and I continue to write article for my blog and I learned what kind of injuries I have and I want to learn deeper about sport injuries because I scare to become like Ronnie Coleman. Ronnie Coleman is the best bodybuilder for me, it’s because of him I started seriously to train like a bodybuilder when I was on the streets. And now, see this living legend who can’t walk without a crutch, it’s too sad. I want to have the best athletic body I can until I die, I’m more focus about sport injuries. More I know about it and more I can avoid it. Every day I do my stretching session and I do 2 special movements to help my left shoulder to decrease the pain. I will see on 15th July, if my recovery session is effective. It’s important not to take lightly the pain of your body. I know a lot of people who had pains a few years ago and they had to do some surgery. Now, they can’t use their capacity at 100%. What’s up ? This is THE stephane ANDRE ! I watched an Athlean-x’s video and I learned some good stuff. I wrote an article about to avoid pain when you do dumbbell press or overhead shoulder press because I have a pain when I do it. Click here to read the article . I have the same problem with the dumbbell bench press. I have pain when I do it, so I write this article to continue this exercise without pain. Bench press is one of the fundamental exercises to build muscles but with this pain, I wondered if I should continue doing this exercise because it hurt. The reason for this pain may be a biceps tendonitis, a torn labrum, an inflammation or shoulder impingement (inflammation in rotator cuff). All these problem create instability during this exercise while we know that stability (body’s stability and dumbbell’s stability) is very important to perform the movement properly. In the case of a torn labrum, labrum is tied to the biceps tendon or rather the biceps tendon is attached to the labrum. During the movement, it’s the tension of the biceps tendon that pulls on the torn labrum. The solution is to change the elbows position. To do the classic bench press, the elbows are at between 45° and 90°, dumbbell held horizontally in the hands and you press up. To calm the pain, we’ll change the position. 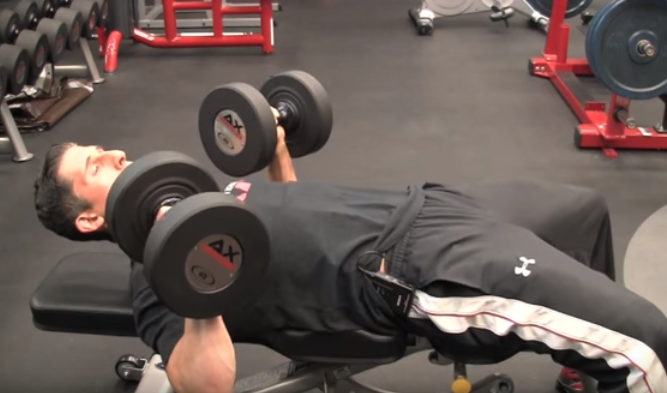 The technique is to tilt the dumbbells so that the dumbbell’s back are facing the ceiling. This brings your arms closer to your body because you use a semi pronated grip. 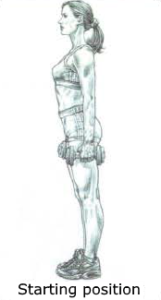 With this position your hands and arms make your shoulders have a neutral position. 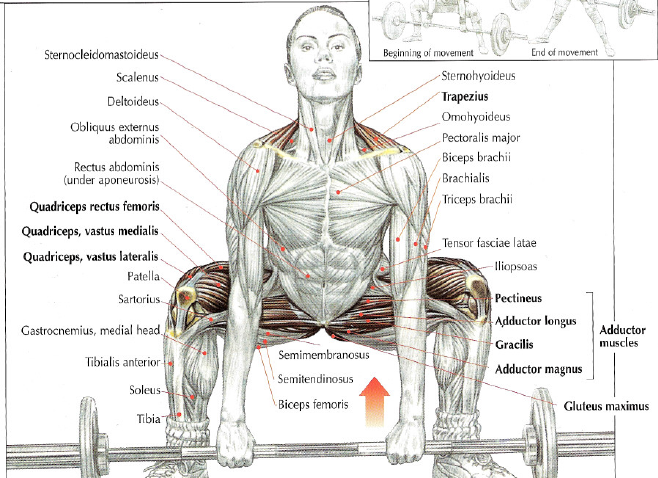 It’s the equivalent of barbell corner press which helps to reduce the pain caused by dumbbell press . You use your triceps more than your biceps during the movement. With the classic position, you use your biceps to stabilize dumbbells than your triceps. With this position, you flex your elbows so you use more triceps to stabilize dumbbells than your biceps. Using more triceps than your biceps will seriously reduce the pain or make it disappear because there is less tension through the biceps and it will less pull on the torn labrum. If you have biceps tendonitis or inflammation, this will seriously decrease the pain. Try this technique and you’ll see that it will be the first time you’ve been doing pain-free bench press for a long time. I read a Frederic Delavier’s book « Strength Training Anatomy » and I learned good stuff. Inhale and round your back to bring your torso to your thighs. This exercise is excellent because it allows you to adjust the weight relative to your level. You can use lightweights if you’re a beginner or heavyweights, without risk, if you’re an athlete. Inhale and take a big step forward by keeping your torso as straight as possible. During exercise, the thigh of the leg that is moving forward must stabilize horizontally or slightly below. Back to the starting position and exhale. With a big step forward (hamstrings and gluteals will be work a lot and rectus femoris with iliopsoas of the back leg will be stretched). As all the weight transferred to the leg that moves forward and the movement requires balance, it’s advisable to use lightweight to begin with. Inhale and take a big step forward by keeping your core as straight as possible. 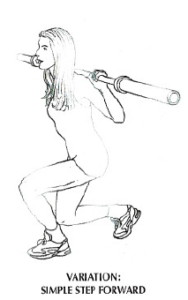 During exercise, the thigh of the leg that is moving forward must stabilize horizontally or slightly below. Bent your legs to have your thighs in horizontal. Your arms are straight, you take the barbell with a pronated grip. 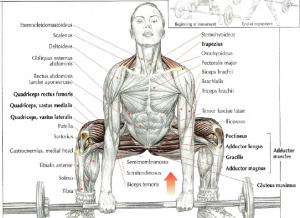 Your hands on the barbell are to your shoulders’ width. You have the possibility to have one hand with a supinated grip and the other with a pronated grip to prevent the barbell from rolling. And with this technique, you can lift an extremely heavy weight. Inhale and block your breath. Arch slightly your back, squeeze your abs and you stretch your legs by straightening your torso to have a vertical position with your shoulder drawn back. Exhale at the end of the movement. Put back the barbell on the floor by blocking your breath. It’s important to keep your back straight during all the movement to avoid injury. 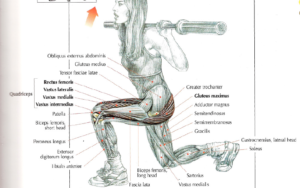 This exercise works especially quadriceps muscles and adductor muscles. This exercise works less the back’s muscles than the classic deadlift because the back is less bent at the starting position. 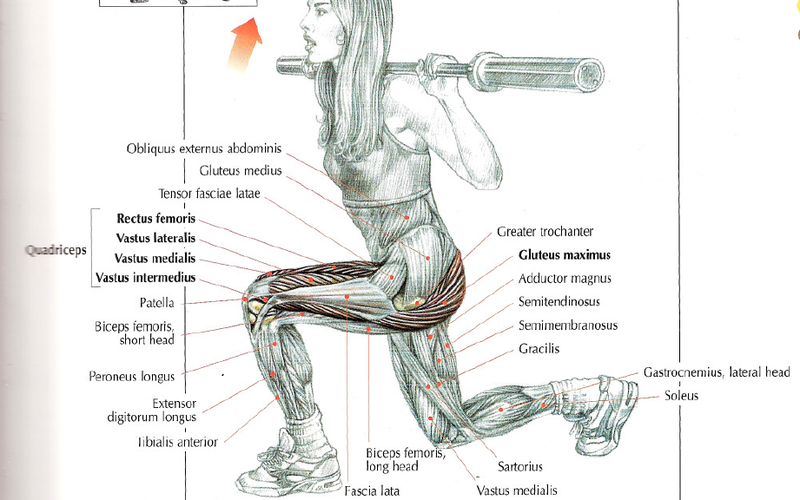 It’s important to lift the barbell in front of your shins at the beginning of the movement. Do this exercise with light weights and high sets (maximum 10 sets) to strengthen the lumbar’s region by working thighs and gluteus. If you do this exercise with heavy weight, you need to be careful to not trauma hips joints, adductors muscles, and lumbosacral junction. The sumo deadlift is one of the 3 powerlifting’s movements. I watched a Jamcore DZ’s video and I learned good stuff. When I look in the mirror, I see that my right biceps is bigger than my left biceps. And I also see that my left calf is bigger than my right calf. I think you too, you have weak points and an asymmetrical body like me. I tried several technique to clear the weak point of my left biceps by doing more reps or lifting heavier with my left arm. But it didn’t work as I thought and I realized that there were even more factors that caused my asymmetrical body. You have to know that there are real weak points and false weak points. And yes, there are 2 type of weak points. These are the sports that you have done regularly before you train seriously at the gym. For exemple, I played soccer for 2-3 years so I developed a lot of my legs and calves. I have been doing karate, kung-fu and taekwondo for years (I have more than 15 years of martial art) so I developed a lot my back, my arms, chest and my abs. My past sports allows me to develop all these muscles (calves, legs, back, arms, chest and abs) even more easily. Now I’m going to tell you about the difference between a real weak points and a false weak points. In my case, I have nice abs, nice, chest. My arms are correct (I have one arm bigger that the other) and my legs are correct (I have one leg bigger than the other). For example, a soccer player or a cyclist will use his/her legs and calves more often. A boxer will use his/her arms, back and abs more often. 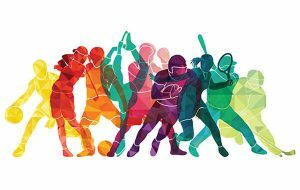 This shows that the past sports is important in muscle development because people developed more rapidly the upper body’s muscles rather the lower body muscles or the reverse. So don’t worry because absolutely everyone has an asymmetric body (if you know a person who has a 100 % symmetrical body, attention, it’s a robot). It’s the moment to go to the higher level. Now, you understood that there are people who can easily develop the upper body’s muscles rather that the lower body’s muscles or the reverse. In both case, there is the same problem : an asymmetry. We’re human beings, we are not perfect and that is normal. Professional bodybuilders also have an asymmetric body like you. It’s for everyone like that. When we look at the mirror, we have a more developed part than the other. 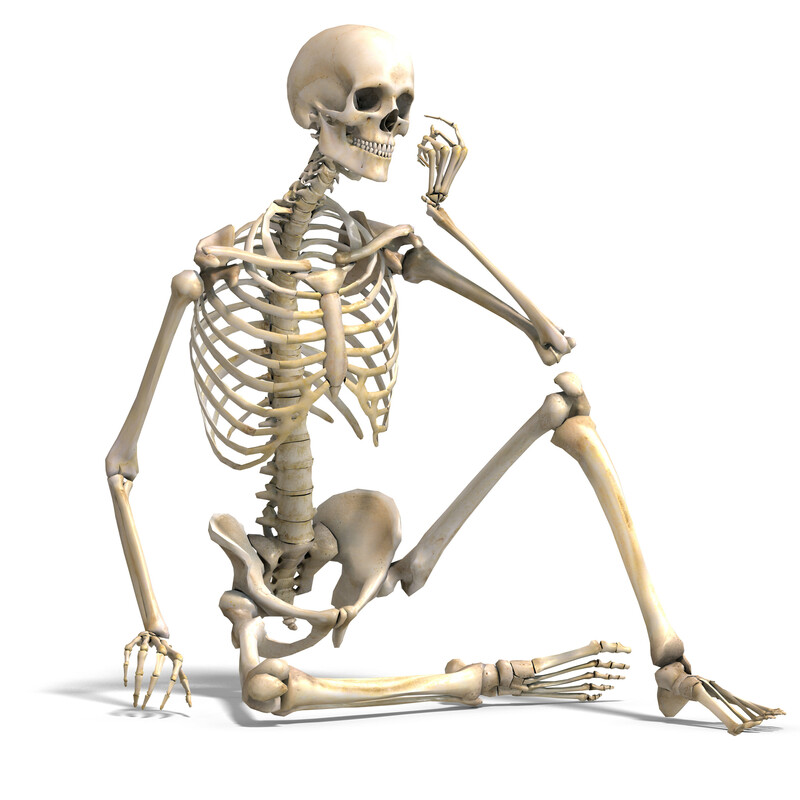 Because of your bones, there is one side of you body that can lift easily heavier weights that the other. So the side muscles that can lift easily heavier develop faster. We all have a longer clavicle than the other. Take you time, check the length of your clavicles, you will be surprised. 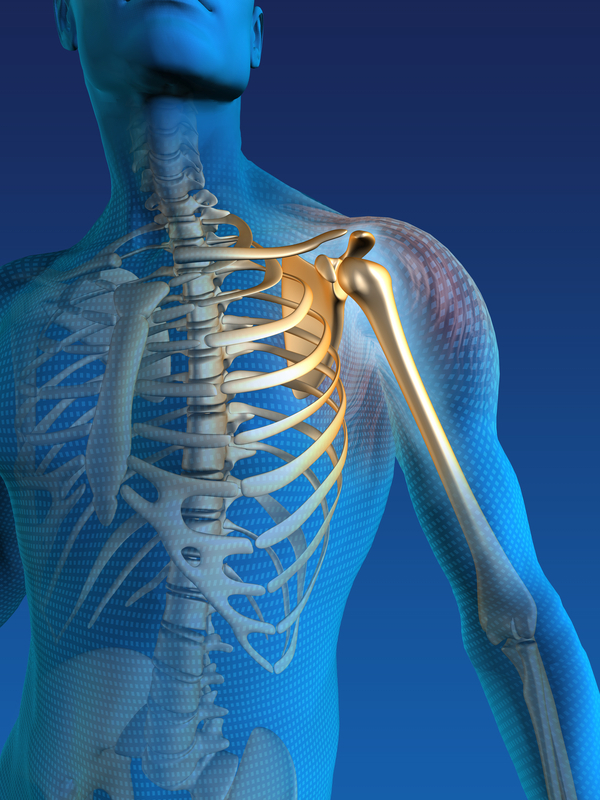 When the clavicle is longer, this affects the leverage when you lift weights. This means that it boost your strength and your muscular growth. But, there is a solution to avoid that there is a big difference between the 2 sides. It’s learning to isolate and feel your muscle. I use a technique called « magic touch ». Before doing a set, I touch with my fingers the muscle that I have to work. This allows me to be focus and stay focus on muscle sensations. This is to create the connection between my brain and my muscle. This is why it’s important to take light weights to learn how to perform a movement to learn the muscles sensations. For example, bench press. There are people who use too much shoulders when the arms are straight. Bench press is an exercice to work mainly chest and not shoulders. So pay attention to your muscles sensation when you to an exercise and adjust. 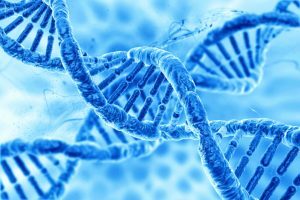 This is really a genetic case. There are people with short muscles or long muscle. Take as an example a short biceps and a long biceps. A short biceps responds slowly to training because the muscles is less close to insertion with the joint. 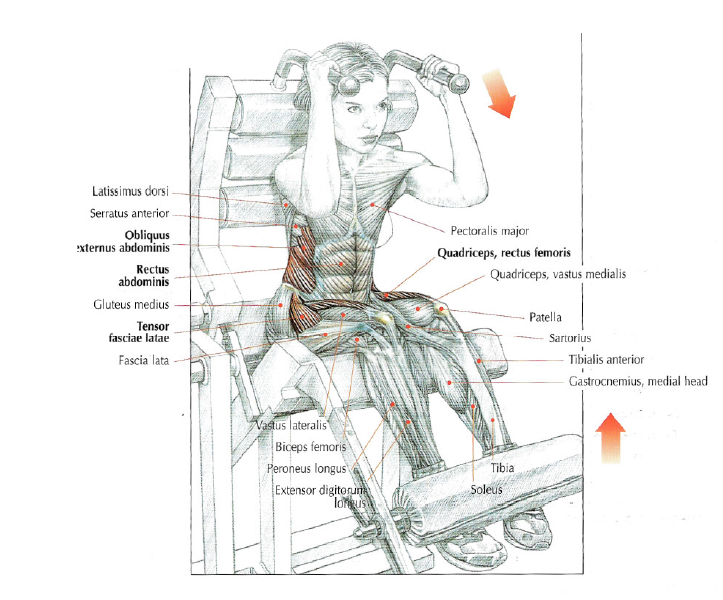 A long biceps respond quickly to the training because the muscle is closer to insertion with the joint. As you can see, there are some similarities with the clavicle’s length. When the muscle is long, it’s easier to develop the muscle. This is something you can’t change and doing an operation to lengthen your muscle is useless. 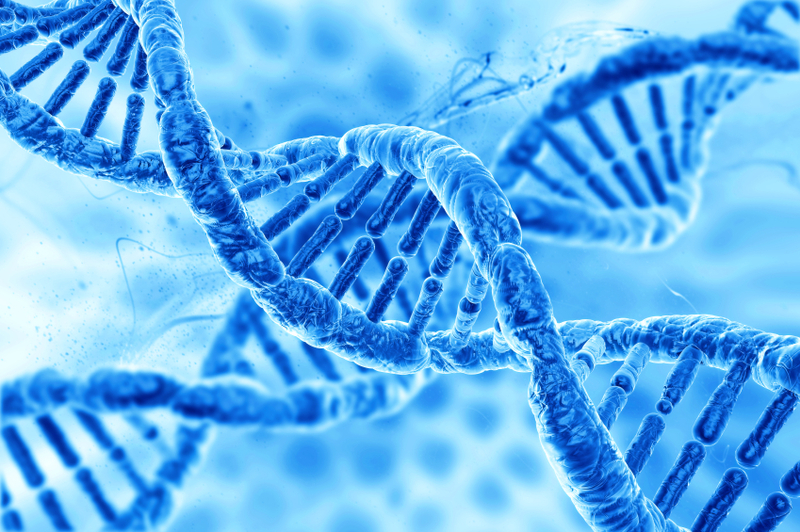 It’s your genetics that decides whether your muscles are short or long. Wait, it’s not over yet, there’s still plenty of other things in the genetics that influence muscle development. In your training, you can use several techniques to stimulate your muscle fibers like « High Intensity Training » . Dorian Yates (6x Mr. Olympia), used this technique during his career as a professional bodybuilder. This technique stimulates muscle fibers even more that hypertrophy . There is also nerve genetics. It’s the ability to isolate and feel the muscle you’re working on. It’s an ability that improves only with experience and time. Here is the end of the Part 1. The Part 2 comes soon.